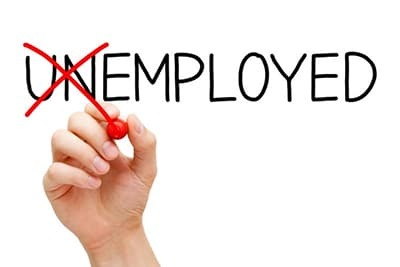 Work requirements for people receiving food stamps were put back in place in Pennsylvania on March 1, 2016, after the federal government declared that the massive recession that begin in 2008 was finally over. Many able-bodied adults will have to be working to receive food stamps for more than three months. Able-bodied adults without dependents (ABAWDs) who are not meeting federally defined Supplemental Nutrition Assistance Program (SNAP) work requirements will only be eligible for those benefits (“food stamps”) for 3 months in a 3-year period. If you meet the work requirements you can continue receiving food stamps. Who is in the able-bodied adult without dependents (ABAWD) category? The food stamps work requirements will apply to you if you are between the ages of 18-49, do not have a physical or mental disability that would prevent you from working, and are not caring for a child or incapacitated household member. Are there exceptions to the SNAP work requirements? The mental or physical condition(s) must be documented and signed by a licensed medical practitioner unless you are eligible for SSI, social security disability, Medicaid disability, VA needs-based pension payments, or other government benefits due to an inability to work. Living in an area that is exempt. In Allegheny County the only exempt areas are McKeesport, Penn Hills, and West Mifflin. — a public or private place not designed for sleeping – parks, benches, etc. Able-bodied but jobless adults without children or a disability (ABAWD) must either be working or participating in a job training program at least 20 hours per week (an average of 80 hours per month), or volunteering with a community service provider for a certain number of hours (see below for details and required number of hours) to continue receiving food stamps for more than three months. You may also do a combination of work, work program, and community service activities to meet the 20 hours per week requirement. If I am in the ABAWD category, how can I make sure to keep my SNAP benefits? If you are working but are working less than 20 hours per week, talk to your employer to see if you can increase your work hours. You can also participate in an eligible job training or work program for at least 20 hours per week. You can also combine work hours or hours in a job training program with community service to meet the 20 hour requirement. If you are in the ABAWD category, talk with your PA Department of Human Services (DHS) caseworker to learn more about your options. You can ask your caseworker about enrolling in the KEYS program to meet your work requirement. KEYS is a program at community colleges that can include GED classes, non-credit certification programs, or college level courses, and provides support throughout your enrollment. Volunteer at an eligible non-profit or community organization to “work for benefits.” The required hours are found by dividing your total SNAP benefit by the state minimum wage of $7.25/hour. For example, if you are receiving the maximum amount of food stamps — $194 for a single person — you will need to serve an average of 26 hours per month ($194 / $7.25 = 26 hours per month or about 7 hours per week. You can use the handy calculator on this page to figure out how many hours of community service you would need to do based on your benefit level.) You must give your DHS caseworker documentation of your community service time. Just Harvest in partnership with 2-1-1 of United Way of Allegheny County has put together a network of non-profit organizations that will host people needing to do community service to meet the ABAWD work requirement. >> Find a volunteer position. Is there help with things like transportation and clothing for people required to do community service? Yes. The Department of Human Services (DHS) can give you Special Allowances (SPAL’s) to help you meet the requirement. SPAL’s include things like: money for transportation (public and private), clothing (if specific clothing is necessary for the work program), and supplies, books, or tools needed for education, work, or community service. These allowances must be requested and approved before their purchase, and verification (receipts) must be provided. Did you receive this food stamps notice from the PA Dept. of Human Services? If you received this notice you should determine if you are exempt from SNAP work requirements by using their screening tool (link below) and communicating that information to DHS immediately. If you are not exempt, you will still need to talk with your caseworker about either getting a referral from DHS to participate in the Work Ready program or getting engaged in a community service activity (more info below). The information that's on this page about the new food stamps work requirements in a downloadable print-ready handout. An abbreviated version of the info on this page in a downloadable print-ready handout. 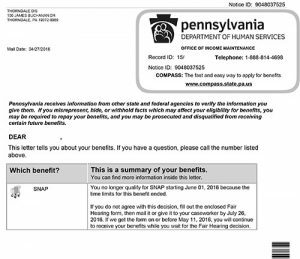 This questionnaire from the PA Department of Human Services will help you figure out if you are exempt from the food stamps work requirement. Use this form, signed by a doctor or other medical professional, to show that you have a mental or physical disability, you are pregnant, you are in a mental health counseling program, or you are in a drug or alcohol treatment program. If you volunteer your supervisor will need to fill out this form and submit it to your DHS caseworker every month so you can continue to receive food stamps. View our listing of volunteer positions that can help you meet the food stamps program community service requirements so you can keep your benefits. Looking for job and career readiness resources in Pittsburgh and Allegheny County? Call (412) 622-3133 to contact the Carnegie Library Job and Career Education Center. Do you need food now? Call the United Way hotline at 2-1-1 and ask to be connected with a food pantry in your area. If you need emergency food, let the operator know. Does your organization need some help? Through our Volunteer Match program we are matching local organizations with low-income individuals who will need to do community service to avoid losing their food assistance benefits. Your participation will help your mission while also helping to fight hunger in the Pittsburgh area.